Snowmen at Night by Caralyn Buehner, illus. by Mark Buehner. Perfect for a preschool audience, this whimsical rhyming story gives us insight to what snowmen do at night. Obviously, they race down to the park where they ice skate, have snowball fights, and drink ice cold cocoa made by snowman mothers. 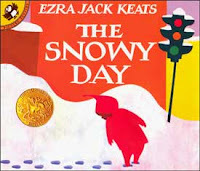 At the end of the book, I asked the kids what snowmen do at night and they said "Melt." I guess they're not buying it. But it's still a fun story. Bearsie Bear and the Surprise Sleepover Party by Bernard Waber. I must confess that I have not read this book. We do it as a puppet story and it's one of our most popular. Bearsie Bear is about to settle down and go to sleep on a cold winter's night when he hears a knock at the door. It's one of his friends wondering if he can share Bearsie's warm bed. We use a basket or bag as the "bed" and whatever puppets we can find. The funny names are a favorite of our preschoolers and we repeat them as often as we can (Cowsie Cow, Goosie Goose, etc.). A Hat for Minerva Louise by Janet Morgan Stoeke. I love Minerva Louise. This goofy hen is always mistaking things for other things with hilarious results. In this installment, Minerva Louise wants to enjoy the snowy winter day, but it's too cold and she needs some warm winter clothes. Make sure all the kids can see the pictures as she goes around the farm looking for winter gear. Froggy Gets Dressed by Jonathan London, illus. by Frank Remkiewicz. We have a felt version of this story and the ending gets them every time. Froggy, eager to run out and play in the snow, rushes out forgetting first his pants, shirt, and coat. The last time he runs out, his mother reminds him that he's forgotten his underpants (say "underpants" instead of "underwear"... it's funnier). 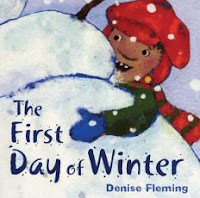 The First Day of Winter by Denise Fleming. A great singable story, the text of this book is a variation of the song 12 Days of Christmas. "On the first day of winter, my best friend gave to me..." At the end you discover that all the articles of clothing and decoration have been going to a snowman. It's niftily portrayed in a vertical spread across the last pages. Fun to sing and cumulative so kids and parents can sing along if they're so inclined. Of course, I have to end my list with this winter classic. I read it to a group of preschoolers last Friday morning. I was a bit unsure about it because it's such a quiet, peaceful story. I tend to be more confident with funny, loud stories. They loved it. I think kids can really identify with everything Peter does in this book. They kept remarking about how deep the snow is and they commented about their own snowmen and snow angels that they had made. When I got to the part about Peter's snowball melting and Peter feeling sad, you could have heard a pin drop. There's a lot to talk about in this book and it makes a great pick for dialogic reading and building narrative skills. And those are my favorite winter stories... now, what are yours? ?